Lace trim on the back of a denim jacket gives a pop of intricate design and lends softness to the rough denim texture. 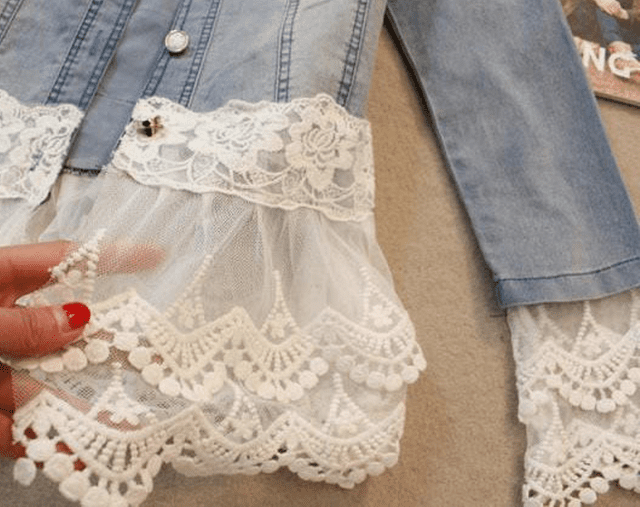 Here are a few easy ways that you can add lace trim and appliques to your favorite denim jacket. Lace trim is available at local craft stores in many different designs, weights, and sizes. Choose a lace trim that complements the existing design of your jacket. 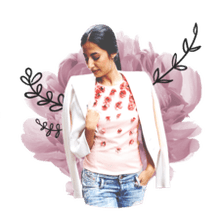 When stitching lace to the cuffs of your jacket, use a thread that is the same color as your denim, and try to stitch along the existing sleeve hem. This will hide the extra stitching and make the lace look like it came with the jacket. At the hem, make sure you are using lace that is long enough to show underneath. Pin the lace first and try the jacket on in the mirror to make sure that it will be positioned where you want it. A denim jacket with a large lace back is like a designer kitchen with an accent wall. This lace addition is just like putting on a large appliqué. Use the seams along the sides of the jacket as a guide, and create a pattern on a sheet of newspaper. Lay the jacket face-down on a solid surface, and trace over the back seams with a pencil on the newspaper. Cut out this shape to use as your pattern. From a large square of lace, cut out the pattern, adding 1/2 inch to the edges for hemming. Hem all edges of the lace. Topstitch the lace to the back of the jacket, right along the side seams. Quilt the lace to the jacket, adding swirled lines of stitching intermittently in the design. This will make the lace lie flat on the denim. The shoulders on a denim jacket can be cut away to create a peep-through look with lace. Cut away the shoulders of the jacket. You may want to draw on one shoulder first, make a pattern of this cut with paper, then duplicate the exact cut on the other shoulder with your new pattern. Cut two pieces of lace 1/2 inch larger than the holes in your jacket shoulders. Pin and then stitch the lace to the inside of the jacket holes. Use a thread that is the same color as the jacket denim. Use a liquid hem solution to keep the edges of the lace from unraveling. Note that this lace project is for someone with slightly more advanced sewing skills. A flat and simple lace design can transform a rugged denim jacket into a sophisticated look. Choose a lace that is not too complicated; the key to this look is simplicity. Avoid ruffles and a lot of eyelet work. Use a measuring tape to determine the entire edge length of your jacket. If your jacket has a collar, measure up and around the collar. Cut a piece of lace that is 1 inch longer than your measurement. Hem the edges of the lace 1/2 inch, using a thread the same color as the lace. Stitch the bottom edge of the lace to the hem of the jacket. Sew along one side of the lace, all the way around the collar. Sew the bottom edge of the other end of the lace to the hem. Sew back up the other edge of the lace, all the way around the collar and back to the first edge of the lace where you started. Add thin lace trim to the collar and selectively to the front of the jacket to give structure and romance to your look. Strips of thin lace trim topstitched to the denim looks great wrapped around the waist or all the way around the collar. Measure along the jacket where you want to place the lace. Cut a piece of lace 1 inch longer. Hem the lace 1/2 inch on the edges. Pin and then topstitch the lace to the jacket with a thread the same color as the lace.